The Californian city, located just one hour from the border with Mexico, is well-known for its surf scene, quality of life and the splendid landscapes that surround it. Staying true to Bellerose’s American influences, we’ve paid San Diego a visit—camera in hand, obviously! Follow us on an adventure to our favorite spots and you’ll be sure to make the most out of your next trip to this gorgeous metropolis. Our journey begins in the residential neighbourhood of Sunset Cliffs, which is bordered by the Pacific Ocean on the west. This famous hiking area provides visitors with stunning views of sandstone meeting the ocean, complete with impressive cliffs and natural rock formations. Its rocky beaches are very representative of San Diego and a popular location to watch local surfers braving the waves. Last but not least, Sunset Cliffs is also a prime sunset watching spot. Just pack up a picnic and some wine and enjoy the views! Because road trips and America go hand-in-hand, how about you take one to Encinitas? The beach town is just a 30 minute car or train ride away from San Diego and is another internationally renowned surfers paradise in the area. Our tip? Get there for sunrise and have an early-morning surf session at Swami’s. Its mellow waves make this a perfect spot for long-boarding. Not your thing? You’ll still be able to have a great day on Swami’s beach, a relatively well-kept secret where the locals love hanging out. Time for breakfast: just grab a delicious açaí bowl from Swami’s Cafe before exploring the streets of Encinitas! Another stop we can’t recommend enough is the Self-Realization Fellowship Temple with its beautiful gardens overlooking the ocean. A perfect mix of desert and lush tropics, the gardens are ideal for cooling down, meditating and practising mindfulness. Not sure where to start? We love the Headspace app, which provides you with short guided meditation sessions. Back in San Diego, the best food to have is definitely street tacos. You’ll find taco stands everywhere downtown, and the best ones often happen to be true hole-in-the-wall places. Don’t be fooled by their modest interior and how small they are and be ready to have some of the best Mexican food you’ve ever tasted! Some of our favorites include Las Cuatro Milpas, Tacos El Gordo and City Tacos. You’ll probably have to queue for Las Cuatro Milpas but the Mexican fiesta inside your mouth will definitely make it worth the wait. This old-school Mexican joint has been renowned for its homemade tortillas & picnic-table decor since 1933 and has been a locals’ favorite ever since. For a more edgy and contemporary take on Mexican cuisine, head to Lucha Libre on Washington Street. For a little pick-me-up, we recommend paying Coffee and Tea Collective a visit. A local institution, this coffee shop serves some of the best brew in town and is an exhibition space for confidential local artists. 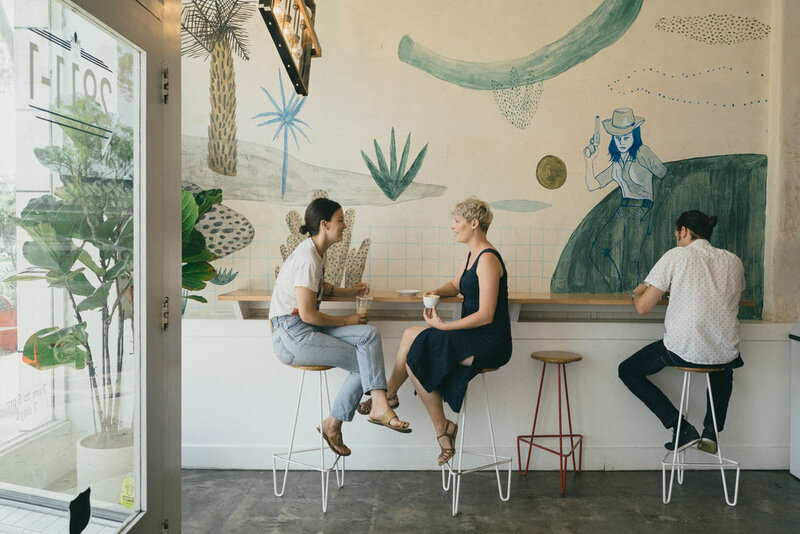 They roast their own coffee and are actively trying to encourage the growth of a blooming coffee culture in San Diego. While they have several locations, their flagship roastery and tasting bar is located in the North Park neighbourhood, just off of 30th Street and El Cajon Boulevard. After coffee, be sure to pass by Aloha Beach Club, located nearby. This stylish store sells menswear & accessories inspired by Hawaii. We also love Hunt & Gather for vintage clothes, jewelry, artwork & vinyl records, as well as Pigment, a retailer that carries a wide range of design objects for the home as well as plants and kitchen accessories. While you are in the area, we also recommend exploring Adams Avenue in Normal Heights, which is full of great local restaurants, bars and clubs. For more shopping, you should visit Maven, a curated lifestyle shop with a focus on independent brands. Another close-by favorite of ours is Little Dame, a fun alternative retail shop and art gallery specialising in taxidermy, zines, feminist art and handmade goods. End the day with a drink from Polite Provisions, a hip cocktail bar that also serves a great, daily changing selection of craft beer and wine. Belgian traveler duo Louis Vielle and Larissa Mathieu went on a journey from Kandy to Ella and they’re telling us all about it on the Journal. Follow their adventure and discover their tips to make the most out of your next trip to this gorgeous island.